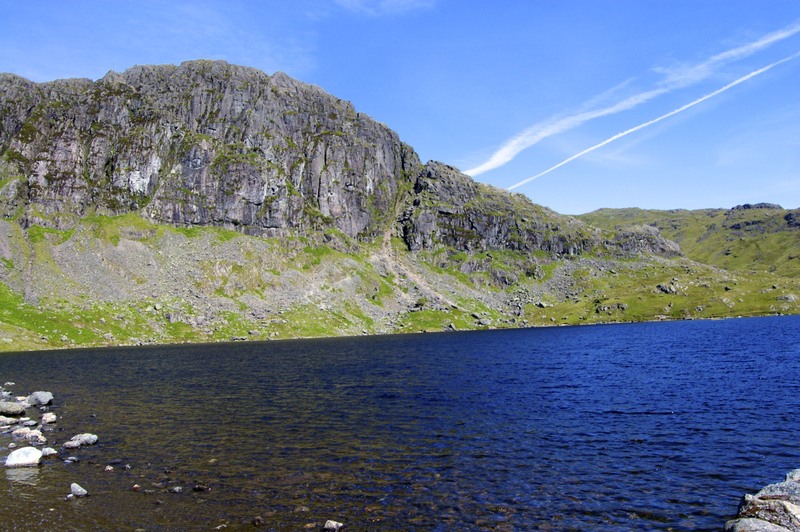 The waters of Stickle Tarn were a deep blue set against the greys and greens of Pavey Ark. Easy Gully is prominent just right of centre. Jacks Rake can just be made out crossing the face of Pavey Ark, from the bottom of Easy Gully slanting bottom right to top left. Jacks Rake should only be attempted in good weather, by those who are a) good at scrambling and b) bad at falling off. If you’re at all unsure, Wainwright devotes an informative couple of pages in Book Three of his Pictorial Guides to the Lakeland Fells. I’d be interested to see that – whenever I’m up there I cannot help but be impressed at neolithic mans geology skills. The particular rock formation from which the hand axes are made is not very wide – I’ve had trouble finding it myself. My boss surveyed the axe factories in the 1980s and I have done a bit since. The best bit is to go around the front of Pike of Stickle.